In Dutch it’s called an rei-dance (row-dance). A rei (rey) used to be a choir in theatrical performances, that after every act sang the minds of the audience, or gave explanation and comments. Over time it got its own character, as a sort of intermediate act, sometimes with dance, hence called rei- or row dance. The word "rei" was also used for the group of singers and dancers, the (sung (or spoken)) text and the dance itself. In a round dance, also known as choral dance or dance around the participants do not necessarily take each other by the hand. The dancers move in different configurations: there are circle or round dances and chain dances with the dancers in a straight line or meandering shapes. 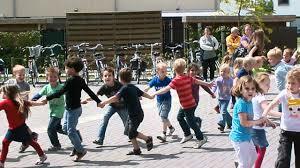 The round dance would come from North Holland, but is known up to French Flanders. It was also a round dance in the 14th century.